I was chatting with a friend on the weekend about how much I absolutely love cauliflower. I used to eat the frozen stuff as a child, heated up in the microwave with ketchup… I couldn’t get enough. I think cauliflower deserves a better rep these days now that we’ve realised it’s potential. My favourite ways of eating cauliflower now are a bit more sophisticated than the microwaved version, swimming in ketchup. My favourite ways of enjoying this brassica vegetable is in a tomato based curry spiced with a massive hit of ginger, in a gratin smothered with gorgonzola or roasted with plenty of spice. Yesterday I opted for the spiced version and decided to bulk the dish out with some kamut pasta. Kamut is an ancient grain rich in vitamins and minerals, especially zinc and magnesium and has a slightly nutty taste. 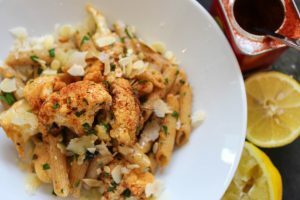 It’s much better for you than regular pasta and although it contains gluten, people with gluten intolerances generally find it easier to digest. I love hot paprika with cauliflower, they go so well together and because cauliflower is a heartier vegetable, it makes a great substitute for meat. 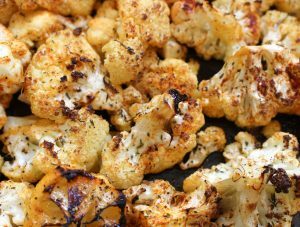 Roasted cauliflower can be eaten on it’s own, served room temperature as a tapas dish or as an aperitif, served cold in a salad or as a substitute for potatoes or rice. I hope you enjoy this version. Pre-heat the oven to about 200C. 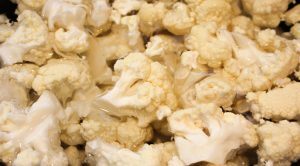 Take a large bowl full of cold water and break off the cauliflower florets or cut with a knife into fairly small pieces. Drain the water and then set the cauliflower on a baking tray. Squeeze over the juice of half a lemon and then evenly sprinkle over 1tsp of paprika, the oregano, salt and pepper and drizzle with a generous glug of olive oil. Roast the cauliflower for about 20-30mins, depending on your oven. You want the cauliflower to caramelise around the outer edges of the florets without burning the cauliflower itself. In the meantime, cook the kamut pasta according to the packet instructions, drain and then set aside. In a large bowl place the drained pasta, cauliflower and parmesan and mix well. Now add the lemon zest and the juice of the rest of the lemon, season with salt and pepper, add the chopped parsley and almonds and finally add the last 1tsp of paprika. Drizzle with a final splash of olive oil and a few more flaked almonds and then serve hot or at room temperature.